For most of the last decade, the European or South Pacific Theaters of World War II were used as the setting for most First-Person-Shooter games. It was where the now famous Call of Duty and Battlefield franchises got their start and where longtime veteran Medal of Honor ran around until they were unable to compete against the playing experiences the two new kids brought to the table. Despite dominating the setting, the sheer number of horrible cash-ins, as well as the desire to see a modern world rendered in all the lovely shades of brown and gray that current generations graphics were triumphantly boasting. Five years since Call of Duty: Modern Warfare abandoned the World War II setting, we’ve now in the midst of doing the same thing with the modern setting, running it straight into the ground. With Activision proudly releasing yearly map packs, the modern warfare setting has been done to death in just five-years, what it took the World War II setting to do in about 8-9 years. Companies are largely unwilling to explore more recent wars like the Vietnam War because of the unconventional style of fighting as well as the ambiguities and atrocities committed during that war. The recent modern games all take place in fictional countries with fictional leaders and motives that hover somewhere just above a James Bond film. There is one setting that hasn’t been explored at all by any major video game developer, or even really any indie publisher, and that’s World War I.
It’s not exactly hard to see why it’s been ignored. It gets glossed over during most American high school history classes because of the United States’ committed mentality towards isolationism. All of the veterans are now dead, and the starting date is quickly approaching its 100th anniversary. Besides all that though, the ambiguity of the war is even more prevalent than in other wars, with no clear “good vs. bad” like with World War II. It was a war was largely brought on by the linger effects of 19th century colonialism, empiricism, arms race, and the shells left over from former monarchies. As for the not so obvious reasons, the war was largely a defensive one, which turned into a massive blood-letting after the German’s failure to take Paris in 1914. 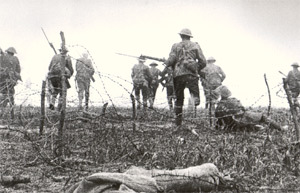 Trenches were set up and fortified with barbed wire, mines, shells, and machine guns. The shells made it possible to laud highly destructive explosives as the enemy to psychologically break soldiers, and machine guns made it possible to mow down entire platoons, suicidally sent by commanders still using techniques imposed by Napoleon. Most offensive weaponry like aeroplanes and tanks were still in their infancy and in most cases never really proved to be effective. Blood-letting is the only way to really describe it, four long years of sending wave after wave of young men to their death for reasons that nobody really understood. All of these reasons showcase why we’ve never seen a World War I video game, however ironically also showcase why we need a World War I video game. Video games are really the only entertainment medium that never fully implants the message of the horrors of war, because in reality war isn’t fun, but a video game is a game, and games are fun. It’s a hard line to walk, because it can give kids the wrong impression of what war is all about. Especially as newer games try so hard to create a realistic atmosphere, while still staying within the realm of video game logic. It’s the reason why you’ll never see a video game where you get shot once and die, or get dragged off the battlefield to spend months recovering in a hospital. That being said, most recent games have always coyly skirted around the true horrors that accompany war. It would be absolutely impossible to create a game about World War I and not include every single horrible blight against humanity that accompanied the war. It’s the game that, if done right, would shake the FPS genre to its very core, and perhaps even force publishers and developers to give more thought into the messages they wish to part with the gamer. Imagine a scenario where you’re controlling your character, and the unmistakable sound of a shell coming is heard, however this shell is full of mustard gas. Your character fumbles for their gas mask and just as the gas begins to seep out, the screams of soldiers closer to impact is heard. The shrieks as the gas enters their lungs, turning into hoarse coughs as it poisons and kills the cells, and there’s absolutely nothing you can do. Or perhaps doing a mad suicidal charge against machine gun fire, where whenever your avatar dies you quantum leap into the body of another soldier only to be cut down. This would easily illustrate the sheer perversion of sending those waves against machine gun fire. There could also be air combat sections, where your plan’s engine is held to the frame with string. There’s no mistaking that it would be an absolutely brutal game and probably impossible to beat, but there’s also no denying that it would leave a profound impact on the players. If done correctly, it could be considered a classic in the same way as Silent Hill 2, for delivering an emotionally impacting story that leaves the player drained in a way that passive media rarely do.